Do you have that itch to get into the ring? We always wanted to be a champion... but there's just one big problem. We stink at boxing. We really don't enjoy having punches thrown at us on the regular! We also don't really know the first thing about throwing a proper punch, so it doesn't look like we'll be dominating the ring any time soon. If it were all just wearing cool robes and posing for promotional fight photos, we'd be pros! The good news is that even if you're like us (hopeless in a boxing match), you can still indulge in your dream of being a pro boxer. All you need is The Champ Boxer Costume and you'll look like the heavyweight champion of the world. This boxing costume is designed to look like the ones that the pros wear. It comes with a pair of black and gold boxing shorts with an elastic waist for a comfortable fit. 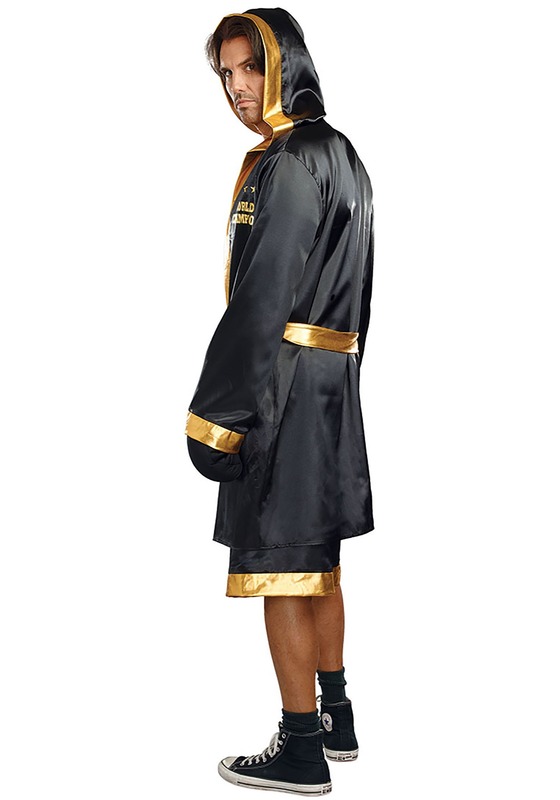 The matching robe also has "World Champion" in gold on the front, solidifying your title as the world's greatest! The robe also has an attached hood to help you make a dramatic appearance in the ring. The golden tie belt adds a pop of color around the robe, but the real kicker to this costume has to be the championship belt. The championship belt has a foam, gold emblem on the front and ties in the back. The black boxing gloves match the shorts and have elastic in the wrists. If you want to be the champ, but don't have any boxing skills, then don't worry! This costume will have you looking ring-ready in an instant. 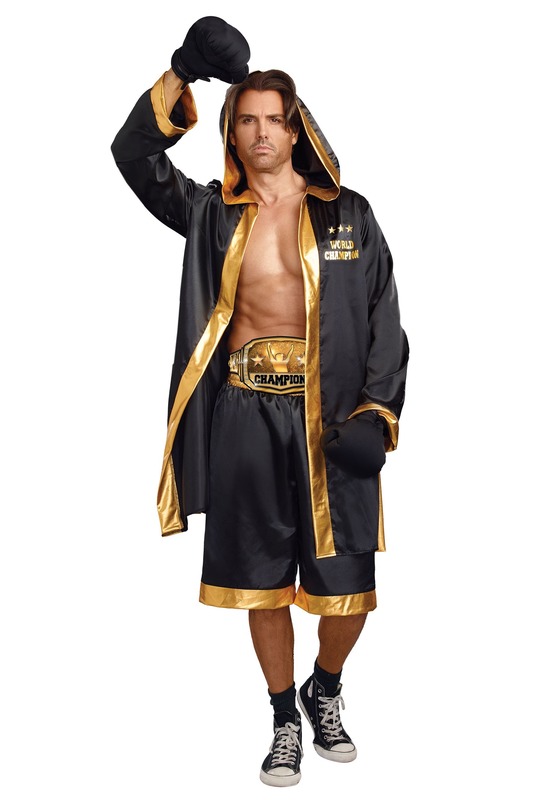 Just make sure that you don't go picking any fights with any heavyweight champions while wearing this realistic costume!